Meningitis attacks members of all races and ages; virtually no one is immune. It can be life-threatening if it’s not treated quickly. At the very least it is important to determine the proper symptoms. 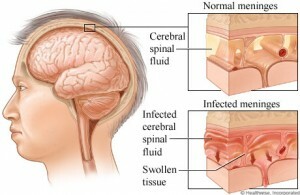 More or less meningitis is the inflammation of the membranes that cover the brain and/or the spinal cord. When it lingers around for so long it’s a dangerous proposition especially for young children. Your meninges, the three layers of membranes that enclose the brain and spinal cord, can swell rather quickly. It can swell due to an infection or virus from another part of the body. One important fact about meningitis is that there are no white blood cells in the spinal fluid to fight off any kind of infection or infectious agent. Once the infection hits the meninges there is no natural body defense that can control the growth. This is why it is vital to take care of the problem immediately. Vomiting – The consistency of the vomit isn’t as important as knowing when you’re vomiting and why you’re vomiting. If you are ever unsure it’s okay to seek a doctor on this so you’re not caught blindsided. It may not be because it’s something you ate. Stiff Neck – Stiffness of the neck is perhaps the most common symptom of meningitis. If it is difficult to curl up in the fetal position with and touch your nose to your knees, it might be a good indication that you meningitis. Neck stiffness from straining or exercising feels different than the pain you get from meningitis. Sensitivity to Light – If it burns or you have to shed your eyes away for several minutes from the light it’s a good indication that you have meningitis. Light sensitivity is different for everybody, but if it feels out of place for you, it probably is. Seizures – Though rare, seizures can cause issues from neural to skeletal problems that can damage the spinal cord. No one knows when the seizures happen, which makes it a little scarier to deal with. Constant Headaches – Normal headaches may come and go, but if you have a constant stream of headaches it’s a good indication there’s a problem with your immune system. If you are dealing with several headaches a day and perpetually throughout the week, get it checked out. Fevers – Fevers at any age isn’t ever a good thing. It’s dangerous and you don’t want to have to deal with it because of the physical toll it takes on you. If you are experiencing fevers that are beyond what you are comfortable in dealing with, it is important to get it checked out immediately. For younger children it’s a little different. There are a whole different set of symptoms of which they will experience. Once you know you have meningitis the next logical thing to do is to get proper treatment for it. For starters, some doctors will see the early symptoms in patients and administer an antibiotic before it can even spread. If the meningitis is viral, then there is nothing the antibiotics can do. In that case, the illness runs its course. A good rule of thumb when patients do have meningitis is to rest, drink lots of fluids, and take in good nutrition. Whatever your normal measures are for controlling fevers and relieving pain can continually be done, too – that is if it is viral meningitis. For bacterial meningitis, an antibiotic is administered for approximately a week, maybe two. It is especially important to note that the overuse of antibiotics can create bacterial strains that are resistant to drugs, making the treatment process more difficult. One thing is certain: No one wants to deal with meningitis for too long – or at all. It is especially worse in little children. When children have to deal with it, their bodies will undergo severe changes because they are not used to such a vigorous attack on the body. Keep in mind; even though meningitis is contagious it’s not as contagious as the cold or flu, which gives you a little more buffer room to work with. It can take as little as a few days to a few weeks to clear up meningitis. It’s important that you know what the symptoms are so you are well prepared to handle your next move. It is always a good idea to schedule an appointment with your doctor if you even suspect you have it. Have you seen anyone having Meningitis before? or this is the first time you are hearing about the deadly Meningitis? I never suffered this kind of disease but I heard about it it NYC having an outbreak. It scares me to death after reading countless cases and deaths about it. I once suffered from this disease (viral) as a result of not being treated long enough for Lyme Disease. It was a nightmare for months, extremely bad heaches and senstivity to light. I could not watch TV or use computer for months. All I could do was rest but I did recover fully from it. Oh yes…we do have people suffering from Meningitis around us, though it’s more prevalent in kids or perhaps I’ve come across kids who face it more as compared to the elders.. The symptoms as you mentioned are many, though what matters most is that you take care and timely treatment and keep it from becoming contagious. oh yes you are right, there are so many people suffering from meningitis around us, and am Glad we have Donna here to write all about it, and hope some people learn from it, Thanks for your comment..
hope to see you around?